I often wonder if, in the history of America, have two candidates ever been more alike than Willard Mitt Romney and Barack Hussein Obama. Really, what we have here are two moderate republicans running against one another, struggling to differentiate themselves because they stride in uniform cadence on so many issues. Case and point, yesterday I heard some pundit make the very real point that both Romney and Obama will cut Medicare, only that with Romney, more cuts are made to the beneficiaries of the program, whereas with Obama, more cuts come from payments to providers and pharmaceutical companies. That’s a difference for sure, but if the best surrogates can do is to amplify minor dissimilarities, then, for practical purposes, there’s not much daylight between Obama and Romney. 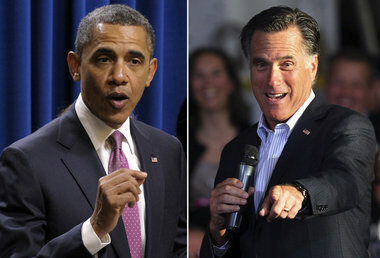 The Obama / Romney phenom is indicative of the seamless melding of the two parties. Their stump speeches couldn’t be farther apart, but their policies are more alike than not. And since the two parties are so much alike, party loyalists are forced to fabricate differences between the candidates that don’t actually exist in order to concoct a real political race with two candidates who have genuine ideological differences. So what makes Obama different from Romney? He’s “Muslim” and “Kenyan”, both fictions. And what makes Romney different from Obama? He’s privileged (as if Obama’s not). The 2012 election is one largely based on the electorate’s imagination. I find myself LOL @ “Really, what we have here are two moderate republicans running against one another, struggling to differentiate themselves because they stride in uniform cadence on so many issues.” I agree with that although the Romney cuts to Medicare I think are exaggerated a bit by Liberals. It’s a way to preserve the Medicare program I think, but at the end of the day as a conservative I am in favor of re-vamping the entire system. Interesting, succinct points. I have come to this view a long time ago. This is correct. Obama’s foreign policy is no different than Bush’s. Nor have his economic ideas been much different in practice. Well, Yvette is right. From what I have read the Romney cuts are to beneficiaries and Obama to providers…etc The way Obama is going though it is not sustainable, which is why I favor Romney’s plan over Obama. That is something I have been laughing at over the last 4 years myself. Bush agreed to stimulus payments, Obama doubled down on them. Bush started Gitmo, Obama agreed it was a good thing to keep it open. Bush started the Patriot Act, Obama continued the Patriot act. Bush lowered taxes on jobs creators, Obama voted 3 times to keep the “Bush Tax Cuts”. Bush didn’t think raising taxes was good in bad financial times and Obama said it wasn’t good to raise taxes in a recession. Bush, the Republicans and Democrats authorized and started wars in Iraq and Afghanistan, Obama maintained troops in Iraq for years, increased troops and drone attacks in Afghanistan and began fighting in Libya without Congressional approval. Bush agreed to keep terrorists in Gitmo for as long as the war on terrorism goes on, Obama said that was not right before he did the same and even began killing Americans with drones. Bush pushed for Military Tribunals, Obama said they should be tried in civilian court in NYC before he decided to use military tribunals. Obama said it was immoral to take loans from China like Bush did and that he would cut the debt in half before he began borrowing more than Bush from China and running up the debt at a greater pace. I could go on but for Obama to attack Bush for things that he has continued to do is really funny. All politicians have similarities and flaws. We just have to figure out which one has the better policies than the other and hope they keep more promises than they do not. Amen Stuart that is so very true! You hit the nail on the head. Exactly. But people fight tooth and nail for these guys, all the while yelling about how “this is the most important election of our lifetime.” Really, it’s not. Well, I think one reason conservatives feel that way is because if Obama is re-elected there could be 1-2 more SCOTUS appointments. Also, Obama shows no sign of slowing down the frivolous spending. He has spent more than all 8 years of Bush in less than 4 years, which should alarm every American. Fiscally, he’s just not responsible, so conservatives are concerned with the potential exponential growth of the US debt which as of today is 15,979,581,275,499 and counting. 5 trillion of that is on Obama’s watch & he can’t blame Bush for that. The Supreme Court is really the ONLY thing that meaningfully differentiates these two men. Whenever someone asks me whether there’s anything Obama’s done during his first term that I fully support, I answer with two words – Sonia Sotomayor.